In his feature directorial debut Ryan Gosling shows us first and foremost just how stylish he can be. Very much concerned with the framing and cinematography of his piece, Lost River relies on both of these camera elements accompanied by the Johnny Jewel soundtrack to set the very specific tone that Gosling wants to elicit. Specific is the key word here because without this preference to create a distinct style that evokes a certain time period (or more specifically the photography of that time period) then Gosling's directorial debut would be almost void of anything else. And yet, the way in which everything has been composed and the way the subtle and sly story is brought to the surface is strangely fascinating. Not necessarily good, but certainly fascinating. We never really feel (or at least I didn't) that there is a solid grasp on anything that is happening. 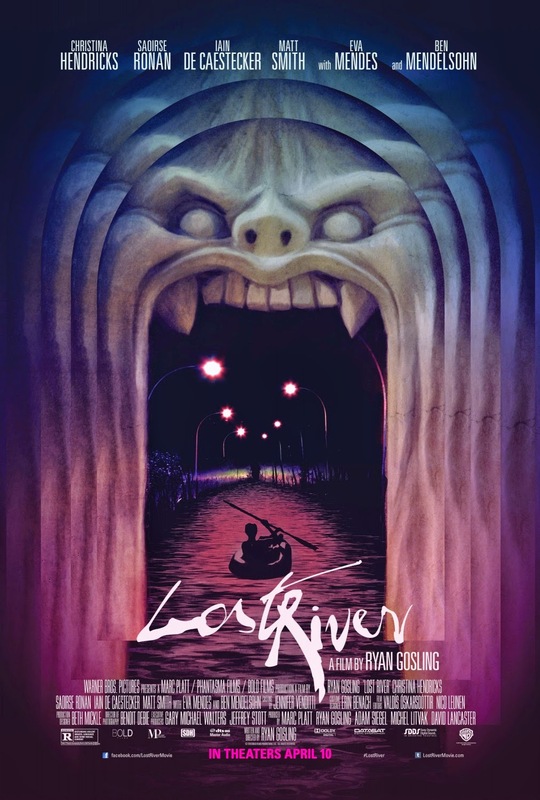 It is understood that there seems to be a super natural element to all that is going on, but compared to something like American Horror Story which tends to finely balance its style with its content while fully embracing its genre, Lost River is unable to give us a compelling story while delivering some rather interesting visual choices. Even in the climax of the film where our assumed protagonist fights to end a curse that has been put on his town and Ben Mendelsohn dances his little heart out the cinematography delves into dark shades so that we can hardly tell what is going on. It's as if Gosling has something very specific (there's that word again) that he wants to say, but is afraid to state it too explicitly. What is it exactly that Gosling's film is trying to accomplish? I don't know that I could tell you. It's too easy to say that it's all style and no substance because while the style of the piece is front and center there is clearly something attempting to be said here; a statement trying to be made-I'm just not completely clear on what that is. There are clear circumstances set-up at the beginning of the film for each of the characters, but it is the mood of the piece that is more important than the story. Much of this has to deal with the oldest son of Billy (Christina Hendricks), Bones (Iain De Caestecker), who encounters a mystic-enticed young woman who goes by the name of Rat (Saoirse Ronan) that convinces him something evil, something of a dark magic is the culprit in turning their once beloved childhood homes into what they call a lost river (which all feels a bit dramatic to say someone bought out some land and is putting in a reservoir). The town is dying anyway as is evident from the shape of the buildings and their decrepit nature, but Billy is resistant to take her sons from the home they grew up in; striking a deal with Dave (Ben Mendelsohn), the man brought in by the bank to buy out the folks still living in this out of commission town. While Bones is initially keen on keeping his mothers dream alive by stripping abandoned houses for copper and selling it, he is threatened by a local thug appropriately called Bully (Matt Smith). Bones isn't the only one trying to make some cash on the side though as Billy takes the hint from Dave that if she wants to stay she'll have to play. By this, he doesn't mean exactly what you might think, but instead alludes to a strange, underworld-like club he has opened. He plays it off as if it's for the benefit of the desperate townspeople so that they might escape the impending threat of their lifestyle forever changing. It is in this dark underworld of sorts that Billy and Bones worlds collide. As do their enemies. With more strange turns from Eva Mendes as a big personality in the underground shows that happen in Dave's club to Smith perfecting his lurking technique every turn of the scene suggests something is seriously off about this old town and the secrets it's hiding. Bones (Ian De Caestecker) gets himself into some trouble in Lost River. In essence, this is an experimental piece from a first-time director who seems to feel more like playing around with a number of ideas rather than creating something solid and concrete from one. This is perfectly fine as a film doesn't necessarily have to say or mean anything and it's sometimes to the advantage of a film to ask more questions than it answers (Damon Lindelof would agree with me on that, I'm sure). The power Gosling's reputation has earned him the ability to do whatever he likes and if Lost River is the fruit of those efforts-all the more power to him. More than a film concentrated on a single idea with a driving plot, Gosling has seemingly created a piece of what he would no doubt like top be referred to as art in that it is more soulful than it is physical. He simply wants to stimulate and not necessarily touch. This is clear even in the construction of each of the characters. On the page Gosling must have written paragraphs of description around these characters and their mentalities rather than writing the dialogue. As you might have guessed, the dialogue is minimal and the personality of each character that walks on screen is transparent more for their presence and performance than anything they actually say. It is clear Gosling has taken cues from his frequent collaborators in Nicolas Winding Refn and Derek Cianfrance as both of these directors visual stylings are imbued in Lost River. Mendelsohn's character says at one point that, "There are basic human needs. We can't cater to all of them." This is true of Gosling's film as well as it's clear from the beginning the cinematography and soundtrack are going to be highlights of the film (get a sense here) and yet it is almost certain that the story will be so vague any number of interpretations could be correct. For me, it feels like some kind of commentary on the decline of the American dream, but that isn't what's important and Gosling likely doesn't care if you understand it as much as he wants it to hit you square in the chest. Unfortunately, though it's fascinating to take in, the end result didn't hit me as hard as it should.